LIC Jeevan Saral Plan 165 Policy is an endowment plan in which policyholder can decide the amount of premium he wants to pay for yearly and half yearly. 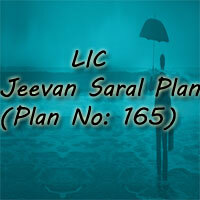 On 16/02/2014 LIC has introduced this Jeevan Saral Plan. Jeevan Saral Lic 165 plan contains a higher death cover, smooth return, liquidity and lot of flexibility. This is a non unit-linked insurance policy with Double Death Benefit of Sum Assured and Return of Premium. Once Premium is chosen, the sum assured that will be paid on death will be determined irrespective of age and policy term. The death benefit will be same regardless of age at entry, but the amount payable at maturity will be different for each age entry and policy term. LIC Jeevan Saral 165 Term Insurance Plan has some key features and Benefits. These features and benefits help you to have a basic knowledge of the Plan so that you can get interested in the Policy. It is a withdrawn Plan which gets a share of the profits in the form of loyalty additions. The loyalty additions are terminal bonuses which are payable along with Death Benefit and Maturity Benefit. Return of premiums excluding first year premiums and extra/rider premium(if any) is payable in Lump sum on death of the life assured during the term of the policy. The sum Assured + Loyalty Additions(if any) is payable with the lump sum. To get the additional benefits, an extra payment of premium is required. You can get these benefits by adding some additional options to your basic plan. Surrender value is applicable on earlier termination of policy/ Contract. There are two types of Surrender values. The policyholder can surrender the policy after successful payment of a premium of 3 Full years. The surrender value will be equal to 30% of the premium excluding the premium of the first year, all the other extra premiums, and premium for accident benefit and Term Rider. 80% of Maturity Sum Assured if 3 or more years but less than four years premiums have been paid. 90% of the Maturity Sum Assured, if 4 or more years but less than five years premiums have been paid. 100% of the Maturity Sum Assured, if 5 or more years premiums have been paid. After completion of 3 years or more from DOC and if premiums have been paid for at least three full years, partial surrender will be allowed. LIC Jeevan Saral Plan has some eligibility conditions regarding the entry age, sum assured, policy term, etc. Check the Eligibility conditions for the LIC Jeevan Saral 165 Insurance Plan. Yearly, Half-yearly, Quarterly, SSS and ECS – monthly mode is available. Sum Assured Rebates will not be provided under this plan. Yearly mode: 2% of the tabular premium. Half-yearly mode: 1% of the tabular premium. 10% of the basic premium is available under this CEIS Plan. To Calculate the Premium, you need some basic information like Name, Number, Email Id, Policy Term, etc. Based on the Policy Term and other parameters policyholders can you can calculate the LIC’s Jeevan Saral 165 Premium. The policyholder can visit the nearest LIC Branch Office to buy the Proposal form. Or you can go through the online to purchase the Policy. You can also get the Jeevan Saral LIC Plan through the Agent. The Policyholder can claim for the maturity Benefit once he/she completed the premium successfully. The Policyholder will also get the loyalty addition(if any) along with the Maturity Benefit. Death claim= Basic death sum assured + (return of premiums – 1st year premium and extra/ rider premiums/ EPDB premiums if any) + loyalty additions – outstanding loan with interest if any. Death claim= Basic death sum assured + Term rider sum assured + (return of premiums – first year premium and extra/rider premiums/EPDB premiums if any) + loyalty additions – o/s loan with interest if any. A rider is an add-on provision to a basic insurance policy that provides additional benefits to the policyholder at an additional cost. Riders are available in this plan. There are two types are Riders are available in this plan. Term Assurance Rider is an option for the Policyholder at the time of premium. You can pay an additional premium to get additional benefits to your policy. Sum Assured Minimum 1 lakh with multiple of 10,000. Accidental death and disability benefit rider are available up to maximum Sum Assured of 50 lakh. Permanent Disability Benefit (PDB ) is not available under this plan. Sum assured for this rider is death sum assured. For auto cover period Accident death and disability benefit rider are not available. Paid Up Value: Paid Up Value Payable on Death or Maturity depends on the no.fo premium paid. Paid Up Value is greater of No. of years premium paid/No. Of years premiums payable X Original Maturity sum assured (OR) Surrender value as per SSV. If the policy holder pay the premium for three full years, and he/she is not able to pay the next premium then, the risk cover can extend to 12 months from the first unpaid premium. For Term Assurance Benefit Rider and Accidental Death Rider, there is no Auto Cover option. Loan: Loan Facility is available under this plan. If the Policyholder doesn’t pay the premium within the grace period, then the Policy will be the lapse. Within the five consecutive years from the date of first unpaid premium a lapsed Term Plan can be revived . This Term plan will be revived before the expiry period of Policy term. A. Yes, there are two riders available for this plan. Term Assurance Riders and Accidental Death and Disability Benefit Rider are the riders available under this plan.